AMD has announced its first 7nm processors will be Ryzen 3rd Generation and they are a doozy. At its CES 2019 keynote, AMD debuted an unnamed octa-core, 16-thread part based on the company’s new 7nm Zen 2 architecture. The new CPU seems to be made specifically to go head-to-head with Intel’s flagship Core i9-9900K. On stage, AMD benchmarked its secretive processor with Cinebench and it achieved a score of 2023 – by our own benchmarks the Intel Core i9-9900K and AMD Ryzen 7 2700X scored 1,873 and 1,798 points, respectively. Basically, you're looking at a 12% increase in performance with this AMD Ryzen 3rd Generation processor. AMD wasn't ready to disclose frequencies as they haven't been finalized yet sadly. What's even more amazing is it seems AMD Ryzen 3rd Generation is even more power efficient than Intel Coffee Lake Refresh. During its Cinebench demo, AMD also displayed the maximum power draw of the Intel system running at 179.9-watts while the new Ryzen system maxed out at 133.4-watts – which makes it about 30% more power efficient. Going a little deeper into the architecture of the processor, it’s built out from two pieces of silicon on packed into one package: one eight-core 7nm chiplet made at TSMC and a second 14nm input/output chiplet – that includes the dual memory controllers and the PCIe lanes – made by GlobalFoundries. 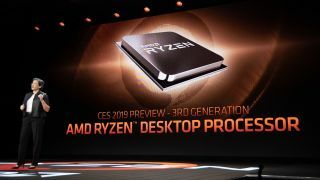 Ryzen 3rd Generation will also be the first mainstream CPUs on the market to support PCIe 4.0, which is said to double the available bandwidth found on PCIe 3.0 from eight gigatransfers to 16 gigatransfers. Another big of good news is Ryzen 3rd Generation is sticking to the same AM4 socket, so AMD's new CPUs will work with existing 300 and 400-series AMD motherboards.